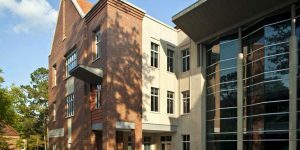 The University of Florida Hough Graduate School of Business offers three Online MBA options through its Hough Graduate School of Business. The Hybrid One Year Online MBA program is designed for students who have earned a business undergraduate degree in the past seven years. The Hybrid Two Year Online MBA is offered to candidates from any academic background or those who earned a bachelor’s in business more than seven years ago. The two-year program includes more core business requirements since its students will not necessarily have covered fundamentals in their earlier education or will benefit from a refresher. UF recently introduced its 100 percent fully-online 24 month traditional Online MBA, recommended for students that prioritize schedule flexibility. The Hybrid One Year Online MBA is comprised of 32 credits. Candidates can start in either early January or mid-August. The year begins with a required orientation in Gainesville on the University of Florida campus. This is followed by a required week-long Foundations Review—a refresher on core business concepts. While lectures and coursework are completed online, students are required to attend weekend residencies every four months. The school notes that exams will likely be administered on the Saturdays, while Sundays are dedicated to meeting with new faculty for the upcoming term. With regard to class structure, the one-year online MBA is cohort based. Students work with the same cohort in the first five terms of their studies. Time to complete the program is 16 months. After completing the first five terms, Hybrid One Year Online MBA students chooses four electives for their sixth term. These electives can be selected from four areas of focus: entrepreneurship, finance, marketing, and international. Students also have flexibility in how they take these electives. They can continue to take the courses online over the course of four months, as they did in the first five terms. Alternatively, they can choose to complete their elective courses on campus in Gainesville over the course of an intensive week. Finally, an international trip, called a Global Immersion Experience, lets students fulfill an elective requirement for the International Focus Area. Recent destinations for the Global Immersion Experience have included Argentina, Brazil, United Arab Emirates, Ireland, and China. Time needed to complete the program is 27 months. The Hybrid Two Year Online MBA is comprised of 48 credits. The 16 additional credits beyond the one-year online MBA allow students to complete additional core requirements in finance, marketing, management, and more. After core requirements are met, the two-year online MBA mirrors the one-year online program in the sixth term. Participants in the two-year program can select from the same four focus areas for their electives as the one-year program and can choose to complete them in the same ways—either online or in an intensive week-long session on campus. Students can start the two-year online MBA in late January or late August. A total of 456 students are enrolled in the Hough Graduate School of Business’ online MBA programs. These students, on average, enroll with a 588 GMAT score, a 3.2 undergraduate GPA, and roughly 6.5 years of previous work experience. The average age is 30. Over 65 percent of the 456 students are male. Approximately 65 of the 456 students (about 14 percent) of the class is comprised of active military members and veterans. Around 27 percent of students in the programs are of minority status, with 7 percent international students. The average individual class size is 47 students. University of Florida MBA and Business Career Services offer online MBA students a wide range of specialized career development tools. Students can partake in career assessments, remote video interviewing, and career development webinars. They also gain access to a résumé book and job board. Students who are partially sponsored by their employers must first secure approval from their company to access these tools. Those who are paying fully for their own education have full access to these resources. The 24-month University of Florida Online MBA currently costs $59,807.52 in total, with $58,000.32 and $1,807.20 in fees. The 16-month Hybrid One-Year MBA currently costs $49,204.80, while the 27-month Hybrid Two-Year MBA costs $59,807.20. In addition to Federal Direct Unsubsidized Loans and private loans, graduate students can also seek Federal Direct PLUS Loans to cover the expense of their education. Those not eligible for Federal loans may also consider loans directly from the University of Florida. All candidates are considered for merit-based scholarships when their applications are reviewed. Scholarships may be based on work experience, academic performance, leadership, and other accomplishments. The Hough Admissions Committee reviews online MBA applications on a rolling basis. Those interested in pursuing an Online MBA from the University of Florida must complete the online application. Interviews are not required for the online MBA programs, but candidates may request one. There are seven steps to the process of applying for an online MBA at the University of Florida: register to apply, complete an Office of Admissions application, complete an MBA Supplemental application, email résumé, send official transcripts, submit two letters of recommendation, and send relevant test scores. The University of Florida prefers GMAT scores but will accept the GRE. Applicants with a doctoral/professional/terminal degree may be exempt from the GMAT requirement. International applicants must submit GMAT scores, not GRE scores, and depending on their English skills, they may also be required to provide a TOEFL/IELTS/MELAB score.